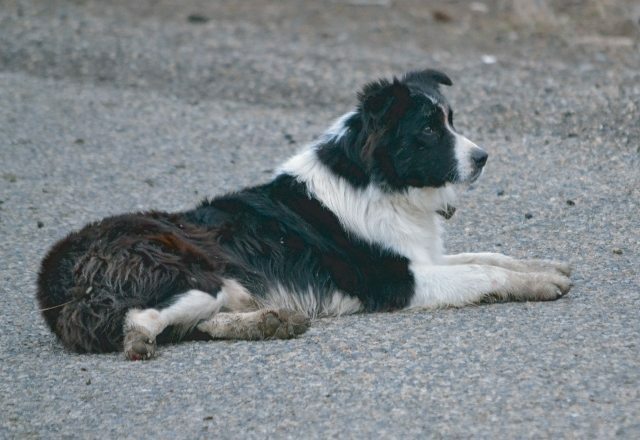 Wilder sheep rancher Frank Shirts has lost one of his border collies to a wolf in the upper Hulls Gulch area, USDA Wildlife Services officials confirmed today. “I thought people would like to know,” Shirts said. Shirts runs several bands of sheep through the Boise Foothills in the spring months as the animals follow the green-up into the Boise National Forest for the summer. The collie was killed by a wolf on May 8th, said Todd Grimm, state director of USDA Wildlife Services. Wildlife Services officials skinned the dog and were able to determine from the trauma and teeth marks that it was a wolf kill, Grimm said. Since that time, Wildlife Services has been looking for wolves in the area with a helicopter to conduct control actions, but they have not been able to find the wolf as yet, Grimm said. Shirts said his herders have been hearing several wolves howling at night, and then the wolves try to come into the band of sheep in the early-morning hours. His herders have been firing off rounds with their rifles to try to keep the wolves at bay. Shirts also has two Great Pyrenees guard dogs to protect the sheep. This year’s wolf kill is the first his herders have seen in the Boise Foothills since 2010, when Wildlife Services confirmed that at least two wolves were responsible for killing 11 sheep — eight lambs and three ewes — in upper Hulls Gulch. Shirts has lost several guard dogs and herding dogs to wolves over the year as well. “As long as the wolves are around, we’re going to have this problem,” Shirts said. After the 2010 incident, Wildlife Services worked on reducing the number of wolves in the upper Boise Foothills area. Grimm said he thought there might be individual wolves roaming the area at this time, but there is not a confirmed pack of wolves. Shirts said his herders have observed at least four wolves and some pups, so it appears that a pack may be forming in the area. The border collie’s name was Teson. Shirts has to spend about $500 on each border collie pup to help herd the sheep. Typically, two border collies stay with each band of sheep to help herd the animals. The herders train the dogs while herding sheep. “Basically, you put the young pups with the older dogs and they learn what to do,” Shirts said. Shirts has found another border collie to work with the band of sheep in upper foothills. The sheep are moving toward Bogus Basin at the present time. By about June 10th, the sheep will be moving deeper into the inland on the Boise National Forest toward Idaho City via Warm Springs Ridge. For more information, contact Stuebner or Todd Grimm, USDA Wildlife Services, 208-373-1630. Stuebner can put the media in touch with Frank Shirts.